The girls had a hard fought win over Balinteer tonight. They could not get more the three point ahead throughout most of the match with great play from both teams. At half time Brigids where up by a very slender one goal lead. But Ballinteer launched a fight back at the start of the second half which put the Brigids girls under serious pressure. A star performance from u13 player Dara Loomes in goals maintained the Brigids lead. 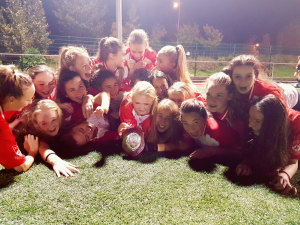 With goals from Cara Galvin, Caoimhe O' Reilly and Claudia Daly proved to be the difference in a game that was end to end and enthralled the supporters. NH Brid lined out as follows. Dara Loomes, Kathryn Dunphy, Isabelle Heffernan, Marie Cormican, Ellie Raftery, Ava Duignan, Caoimhe O'Reilly, Amy Quinn, Cara Galvin, Mia Murray, Aiofe Coffey, Claudia Daly, Amy Boyle Sadhbh Kearney, Ruth Hanley, Eva Moore, Tara Murphy, Sara Higgins, Eimear O'Reilly.